Elegant, sophisticated and updated 6 bedroom 4 bath Colonial on beautiful tree-lined boulevard in sought after Glen. Open living space featuring living room and dining room with plantation shutters and gleaming hardwood floors that flow into spacious upgraded cooks kitchen with premium SS appliances, large granite island, custom backsplash and separate eating area. Sun-filled family room with fireplace and floor to ceiling windows that overlook bluestone paved patio and professionally landscaped yard. First floor bedroom/office with full bath for flexible living. 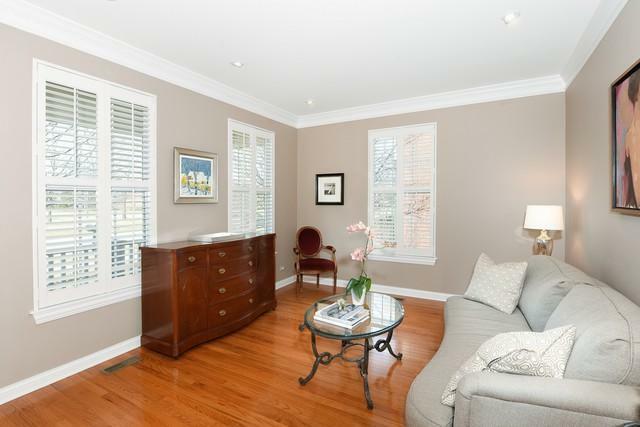 Second level boasts large master suite with spa like bath, walk in closet and three generous bedrooms and full bath. Lower level complete with 6th bedroom, full bath, rec room, kitchen and wine cellar. Many upgrades and custom finishes throughout. Amazing location - close to train, fitness center, lake, walking paths, park, shopping, theatre and restaurants. Award winning Glenview Schools. Sold by Berkshire Hathaway Homeservices Koenigrubloff.